Thank you to everybody who participated in our #ThereSheGrows social campaign, raising awareness of the endangered Leuser Ecosystem in Indonesia. We reached 165 million people with thousands of dedications, but it doesn’t stop there. We want to continue the conversation while turning awareness into action. The next chapter of #ThereSheGrows will look beyond the Leuser to endangered forests worldwide while encouraging people to become agents of change. You can make a change today by donating to our foundation Stella McCartney Cares Green. Any donation, great or small, will go directly toward protecting endangered forests worldwide. Any contributions are sincerely appreciated. Shop sustainably. Shop smart, buy less and love your clothes. By doubling the number of times a garment is worn we can almost halve the fashion industry’s greenhouse gas emissions. Choose organic cotton and viscose that comes from sustainably-managed forests, because sustainably-sourced viscose helps to ensure that ancient and endangered forests are protected and that crucial habitats aren’t destroyed. Go vegetarian. Choosing a plant-based diet can make big difference. The production of beef is one of the largest contributors to deforestation in the Amazon, and by reducing our meat intake, we ensure that less land is cleared. Boycott unsustainable palm oil. Mass deforestation occurs to farm palm oil and we lose up to 25 orangutans a day because their habitat is being cleared. Check the label and buy products that are free from palm oil or use sustainably-sourced palm oil. Go paper free. Go digital with your documents, bills and statements. Go plastic free. Say no to single-use plastic. Our planet is overwhelmed with plastic and we need to act now to reduce the amount of plastic waste ending up in our oceans and in landfill. Plant a tree. One tree can absorb up to 48 pounds of carbon a year, so just planting a single tree can make a real difference. Support local action. Be a voice for change by joining local lobby groups and helping to protect forests in your area. Sign petitions. Make a stand by fighting for protected areas and conservation planning processes. This is a good place to start. Reduce your carbon footprint. Deforestation is one of the largest contributors to climate change, resulting in less carbon being absorbed and more being released. To learn more about your carbon footprint and how to offset it, calculate yours here. And finally, reduce, reuse and recycle are still the gold, silver and bronze for sustainability! The Leuser Ecosystem is still in desperate need of our attention, but there are other forests that need our help—like the Amazon, which produces 20% of the world’s oxygen and is one of the last refuges for jaguars, Amazon river dolphins and harpy eagles, or the Boreal Forest in Northern Canada, which holds the world’s largest supply of fresh water and contains 7 of the 10 largest intact forests left on Earth. 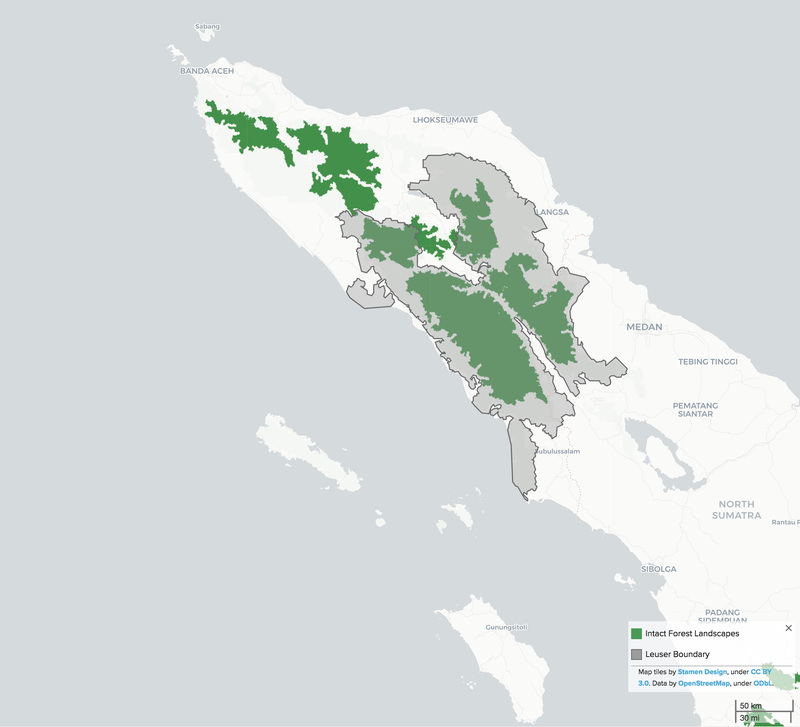 Explore Canopy’s ForestMapper below to learn more about our endangered forests. 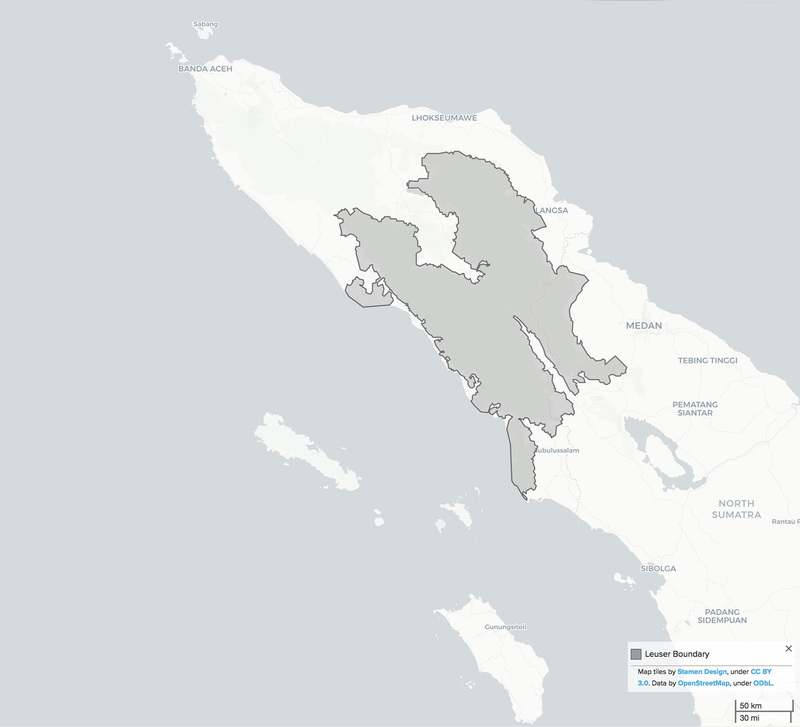 The Leuser Ecosystem spans the provinces of Aceh and North Sumatra on the Island of Sumatra in Indonesia. 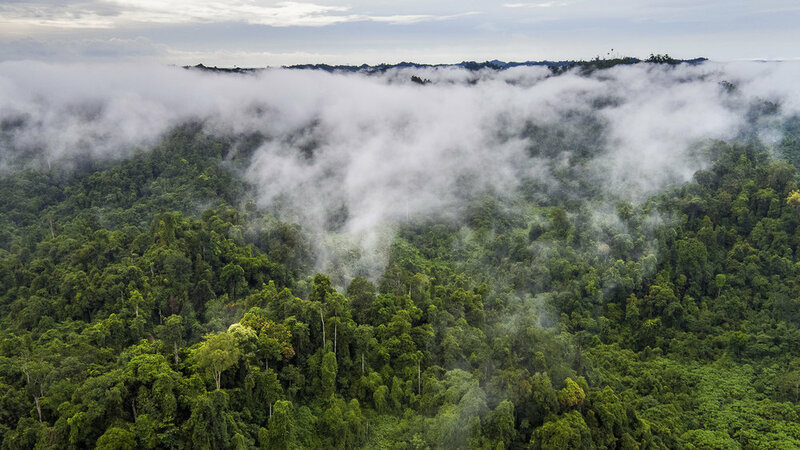 This ancient ecosystem covers more than 2.6 million hectares of rainforests, peat swamps, montane and coastal forests and alpine meadows, globally recognised as one of the richest expanses of tropical rainforest in Southeast Asia. 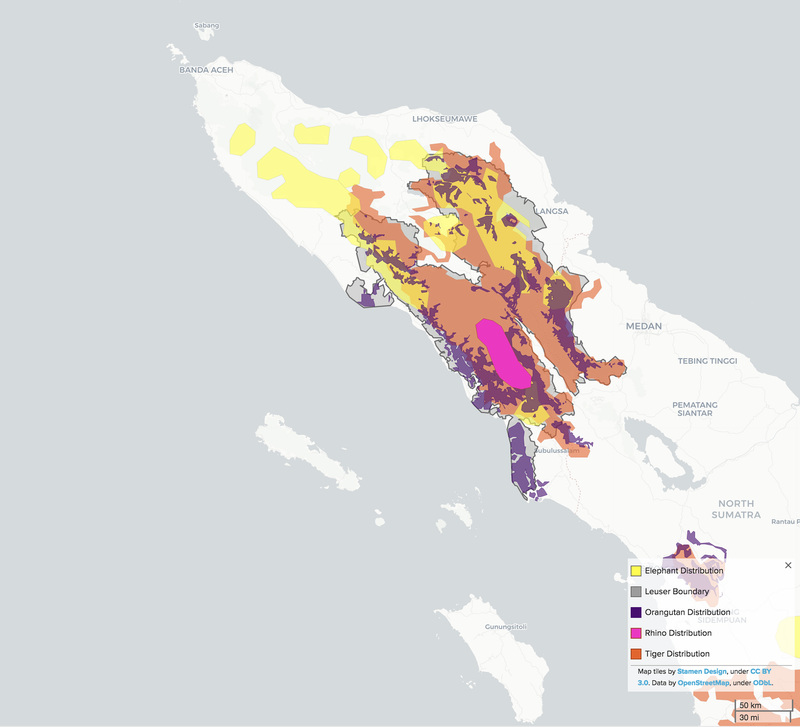 The data displayed in this map is not official data from the Indonesian Ministry of Environment and Forestry. As a result, there may be inaccuracies. Identifies unfragmented forest landscapes of at least 50,000 hectares with a minimum width of 10 kilometres, large enough to retain all native biodiversity and showing no signs of human alteration as of 2013. The map may contain inaccuracies due to limitations in image resolution and lack of information about local land-use practices in some regions. But protecting our forests is not enough. We need to make changes in our own lives so that there is less impact on these forests in the first place. In the lead up to Earth Day, you can learn more about how to become a change agent via our Instagram. Let’s all work together to save our planet! Canopy selected key species in Indonesia whose habitat or ranges overlapped with other globally endangered and wide-ranging forest megafauna, according to the IUCN (International Union for the Conservation of Nature). The Sumatran tiger, elephant and orangutan are all critically endangered species, and the Sumatran Rhino is being pushed toward extinction due to habitat loss. If you would like to learn more about Stella McCartney Cares Green and to be kept up-to-date on our future activities please share your contact details below and we will add you to our mailing list.